When a woman arrives from a refugee camp and lands in Fort Wayne, her world is suddenly and radically different. The weather is colder, the Americans are foreign, and our customs are strange to her. There is a great deal to adapt and adjust to as she navigates this new world. Many times as a lady joins the sewing program at International House, one of the first obstacles she encounters, outside of the language barrier, is making choices. Simple things that American women take for granted are milestones for a newly arrived international. The sewing cottage at International House is a safe and happy place for ladies to make friends and learn a creative skill. Some of the goals we strive for in our sewing program are to build friendships, teach English, inspire creativity, and to share our lives with the sewing students. Understanding the mechanics of a sewing machine, learning the names of the tools needed to sew, and gaining confidence are some of the first steps that happen in a beginning sewing lesson. A sewing project begins by selecting fabric. Often when a lady joins the sewing program, she is asked what her favorite color is. Until I began helping refugees, it never occurred to me that a simple question could be so profound. I learned that it could be an emotional question, with an emotional response. Many of these ladies have never (and I mean never!) had the opportunity to even wonder what their favorite color is. They have been surviving, protecting their children, finding food, finding shelter, living from one day, one second really, to the next. I have learned that a simple question can begin to transform a life. It starts small as a woman realizes she has a choice. She can like blue or red. Then it grows into more than a choice. She can like one color one day and another color the next day. The question then begins to shape her into someone new, a creative, imaginative woman, who has options. Simple options will strengthen her and hopefully begin in a small way to help her to heal the many wounds a lifetime of struggle and lack of choices creates. I have seen a lady stare at the choices of fabric, and not be able to answer. She defers to the teacher. I have seen a woman’s eyes well up with tears at the prospect of the honor of picking any fabric, any color she wants, just for her. I have watched a young girl’s hands longingly and lovingly trail along the folded bolts of fabric in the closet, her bright dark brown eyes dreaming of the clothes she could design. She looks at me with expectation and hope that something so beautiful would be an option for her to explore. Sewing certainly can’t stitch away the hardship, the devastation, or deep-rooted pain and loss that many of the sewing students have endured. 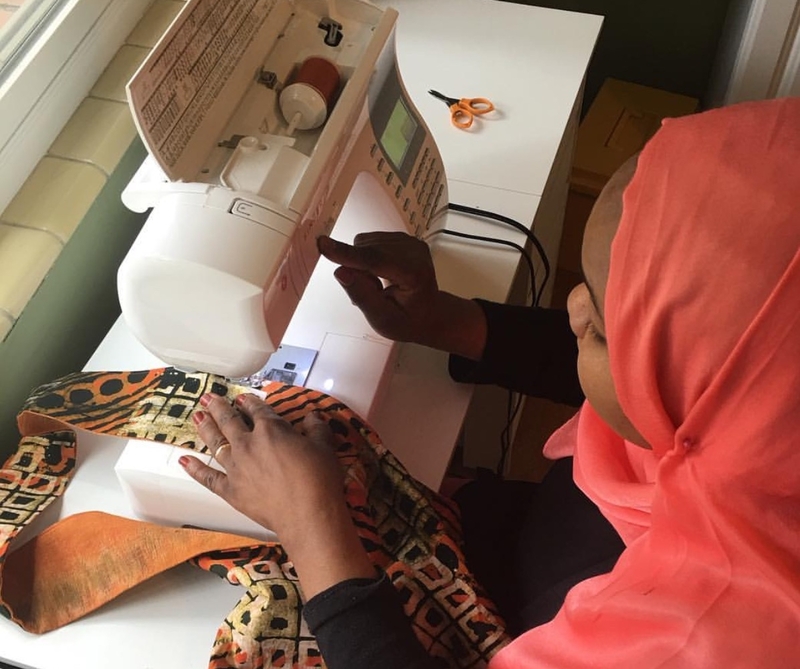 However, a simple sewing machine, an ordinary question, and endless possibilities wrapped around a bolt of fabric can absolutely begin to mend a woman in a small way. International House is a non-profit, non-denominational Christian organization committed to sharing the love and light of Jesus Christ with refugees and other Internationals living in the Fort Wayne area.